Does your rec room seem empty? Have you always admired the skills of billiards greats such as Mike Russell, Steve Mizerak, Mike Sigel, and Joe "the Meatman" Balsis? Did you ever dream of playing poollike Paul Newman's character "Fast Eddie" Felson in the movie "The Hustler"? If so, a pool table might be just the item you've been looking for. Pocket billiards (aka pool) refers to games played on billiard tables with six pockets along the rails. The term "pool" was derived from the association between billiards and "poolrooms" (places where gamblers pooled money together to place bets on horse races). Because poolrooms typically contained billiard tables, the term "pool" became synonymous with the game. Dazadi has a wide variety of pool tables to fit every wallet ranging from the $28 table-top pool table to the luxury Diamond Billiards 9' Professional Maple Pool Table. A solid selection along with a high customer satisfaction rate combine to make Dazadi a great option for your pool table purchase. Whether you enjoy playing one-pocket, eight-ball, straight pool, or nine-ball, there are a number of pool table stores that can help make your dream of owning a pool table a reality. Additionally, the pool tables they provide fall into various price ranges and categories. These stores offer everything from inexpensive, mass-produced tables, to custom-made, high-end pool tables, to durable, outdoor pool tables. Selection. Does the website offer a wide variety of pool tables? Navigation. Is the website easy to navigate? Can you quickly browse through their merchandise to find the right pool table and pool table accessories for you? Expertise. Does the website specialize in pool tables? Does the company provide information to help you make an informed pool table selection? 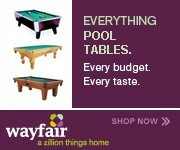 TopConsumerReviews.com has reviewed and ranked the best pool table stores available today. We hope this information helps you find the right pool table for your needs!